Saturday and Sunday, Seattle-area vegetarians, vegans and the veg-curious will gather at Seattle Center for a big green bite of Vegfest 2011. There they’ll graze on samples from 200 vendors, watch cooking demonstrations, listen to health-care pros discuss diet and nutrition, and rub elbows with folks convinced the world would be a better place if we’d all choose to lie down with lions by giving up lamb — among other things. 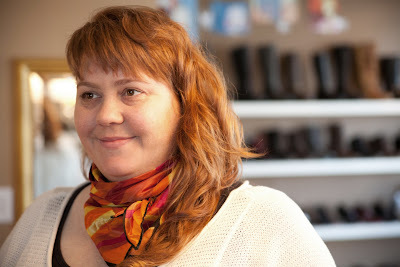 If the (vegan) shoe fits, wear it, says Anika Lehde — the force behind Vegan Score, seen at The Chocolate Shoebox near Phinney Ridge. Why I find her interesting: Because she sees Vegan Score as a “network for sharing” local sources for vegan food, fashion and events, and has made it her mission to turn the city on to places like The Chocolate Shoebox, Seattle’s first all-vegan shoe and chocolate boutique. Looking for love? She’s recently launched a vegan matchmaking service. Want a T-shirt? She’s co-founder of Lion’s Share Industries, which puts local art and meaningful messages on eco-friendly tees. Sure, she’d rather meet me for brunch at her vegan-restaurant favorite, Plum Bistro. Or at the Highline, the vegan bar where she’s crazy about the fried pickles. And if I invited her to a party at that meat-lover’s paradise known as my house, she says she’d offer to bring a vegetable platter, perhaps with a dip on the side made with Vegenaise — a mayo substitute available at QFC and PCC. Spends time: At Sidecar, in the University District, volunteering Sunday nights, and at her office in Pioneer Square as co-owner of Projectline Services, a marketing firm with 150 employees in Seattle, Bellevue and London. If you see Anika on the street: Inquire about the citywide Vegan Chili Cook-Off to be held May 15. And ask about the coffee-table book she’s putting together with photographer and Vegan Score Southend contributor Rebecca Bolte, profiling 52 Seattle-area vegans.